The AISBackup Restore CD may be used to restore your PC back to a previous state using a backup previously made with AISBackup. The restore CD supports backup's made to CD/DVD, local drives, external drives and networked drives including FTP. To learn how to make the AISBackup Restore CD click here. The PC been restored must have at least 512MB RAM installed. If the Restore CD was made using a registered copy of AISBackup additional backup options are shown to enable a backup to be run prior to restore; this could be useful if the copy of Windows you are restoring is quite old and the PC contains documents you want to retain. 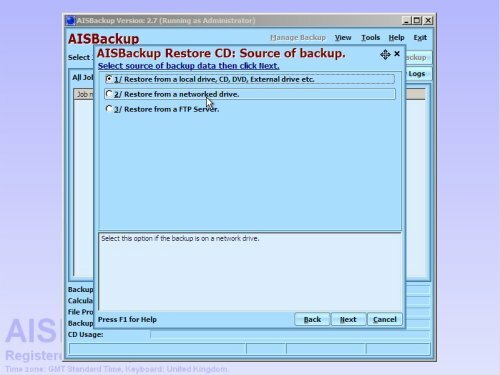 Here are step-by-step instructions for using the AISBackup Restore CD to restore a copy of Windows to new unformatted disks. The backup in fact contains a dual boot system of Windows 2000 and Windows Vista Business, and the restore process will restore both of these operating systems to two new disk partitions. This type of restore is likely to be more complex than an average disaster recovery restore, but demonstrates the restore features of AISBackup. Once the PC has booted the AISBackup Restore CD may be removed from the drive to enable restore backup's from CD or DVD media. 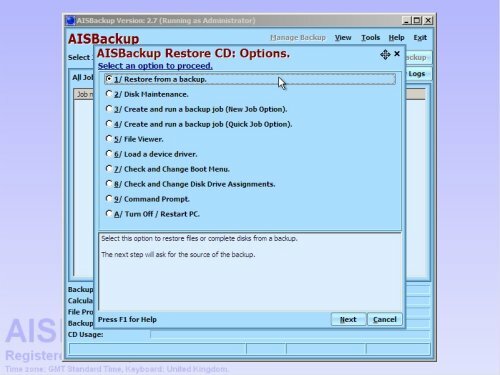 To use the AISBackup Restore CD set your PC to boot from CD and re-boot, press a key when asked or the PC will revert to booting your regular Windows. AISBackup will start automatically and display an Options dialogue from where you may select an appropriate option. In this example the PC contains a new unformatted disk, so click Restore from a backup to proceed. If you wish to make alterations to the disk configuration prior to restore, including formatting a disk partition, choose Disk Maintenance. If the PC requires additional drivers to activate certain hardware, for example SATA or SCSI disk drivers or Network drivers choose the Load a device driver option and choose the appropriate INF file from your hardware manufacturer’s set-up CD.